ETI Annual Awards - Equestrian Trails Inc.
By a unanimous decision, Keith Hilliard has earned the title of Corral 35 Volunteer of the Year. Keith is a member of our Board of Directors with the title of Director of Arena and Parade Maintenance. Our contract with the City of Glendora for the priority use of the Carlyle Lindner Equestrian Park states that Corral 35 is responsible for the complete maintenance and upkeep of the park. Keith has taken this role of Maintenance Director to his heart. He seeds, mows, and waters the lawn areas, which he has expanded from a tiny green patch of weeds to a sprawling lawn that surrounds the arena. He has been active in all of the tree planting, flower bed plantings, weed whacking, and park clean ups. He arranges work days, is present at all of our activities, and is the chief BBQ Chef for our events, and jump setter-upper and taker- down person for shows. If something needs attention, call Keith. He has established a direct line of communication with the City of Glendora in regard to their assistance in Park projects. The list goes on and on in reference to his volunteer work for the Corral in his position with maintenance, but that is not all. Keith has served as Area 3 co-director and Corral 35 delegate to the National Board of ETI. He rarely misses a meeting and his comments are usually met with humor or taken very seriously, as he is a man of few words, most of the time. As Director of Parade Maintenance, Keith is a hometown favorite in his role as Pooper Scooper for the Corral. He garners the most applause and cheers as he does his job in all of our parades. Keith gets to the entry booth, signs us in, and reserves a spot for the horse trailers and staging area, as well as any other job that needs doing at our parade appearances. If all of this is not enough, he is always present to lend a hand at our booth on Trails Days Spring and Fall, Earth Day, and the Blessing of the Animals, to name a few. The list can go on and on, but you can see why the members of Corral 35 embrace Keith as our choice for Corral 35 Volunteer of the Year. We love you, Keith! 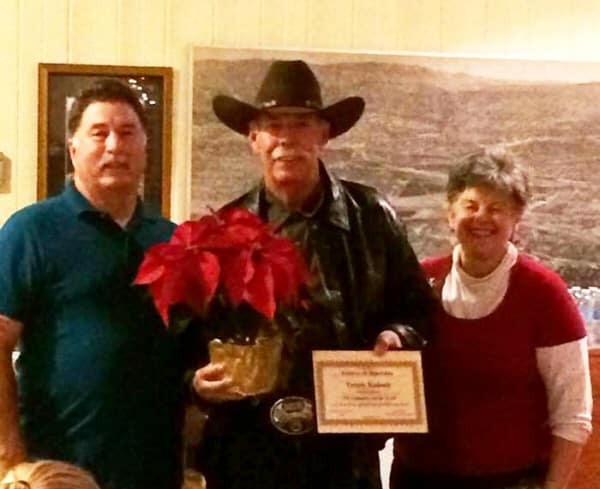 Bob Foster, ETI President, and Linda Fullerton presenting Terry Kaiser, ETI Corral 20, with his Volunteer of the Year award at the ETI holiday party. I knew Terry Kaiser was a keeper when Bert Bonnet, Mike and I took him on a cold dreary trail maintenance day to Cienega Springs above Castaic Lake. This was his first adventure with us, and he was truly a nu-be to our world. We started out at the crack of dawn, worked until dark with the last trek of the day ending up on the side of a wash out where we had to cross the pathless trail and maneuver into a fast flowing bed stream that we followed back to the staging area. We landed back at our trailer well after dark. Terry must have either thought we were crazy, we wanted to see if he was really a city slicker, or if we were testing his internal fortitude to see if his constitution was made of full grit. Well, he didn’t complain that day, though he has mentioned it many times over the years. In any case, from that day forward Terry was trained and has never thought twice in responding to assist ETI and SHPOA in any venue that arose. Terry currently serves on Hansen Dam Advisory Committee, Foothill Trails District Neighborhood Council, ETI Director for Area 7, and Chairman for California Trail Users Coalition (aka C-TUC). C-TUC is a 501-3c which along with other projects such as Sweet Smelling Toilets, Staging area for all recreation use, manages North Fork fire station and has also manufactured routed wood signs over the past 15 years valued at $480,000.00 for the U.S. Forestry Department. Terry is always one of the first to step up during any fire evacuation emergencies organizing us to aid equine relocations. Because of his connections to LAPD and Fire department officials, he is often called when there are equine accidents. In our community of Shadow Hills and Hansen Dam, Terry has volunteered his time to build a safety gate exiting Hansen Dam that stops a loose horse access to a major street which prevents them from being hit by passing cars. For ETI NATIONAL, he has volunteered several years on the Death Valley annual 5 day ride. He has built portable showers with hot water that allow riders the luxury of a clean body during the long ride. For ETI convention, Terry has been our conduit between the management of the LAEC and Horse Show management who coordinates the daily events that allow for a smooth functioning 4 day event. His title is Grounds manager, but the job is truly much more. He still does endless trail maintenance work and also has set up many of our National Trail Trial courses. So in a nut shell, this is Terry Kaiser and his relationship to our equine world. And in his down time, he also volunteers at his church as a greeter/usher and is always available to help set up for special events or anywhere else an extra set of hands are needed. Thank you, Terry, for your many years of dedicated service to ETI and our community. 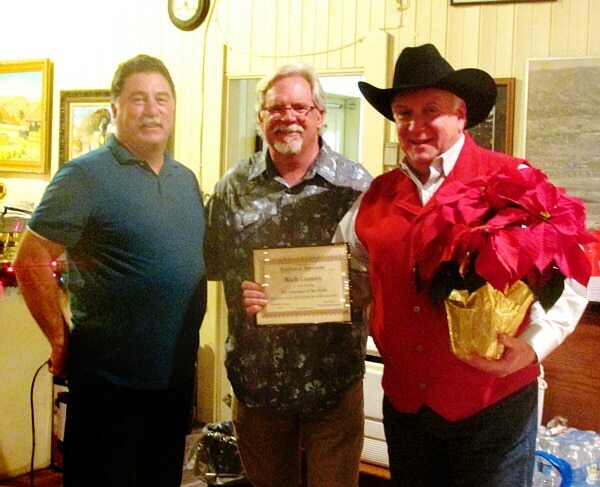 Bob Foster, ETI President, and Rick Balthaser, ETI Corral 357 President, presenting Rich Gomez, Corral 357, with his Volunteer of the Year at the holiday party. Rich Gomez is a long-time South Orange County resident who has had a connection to horses for many years. 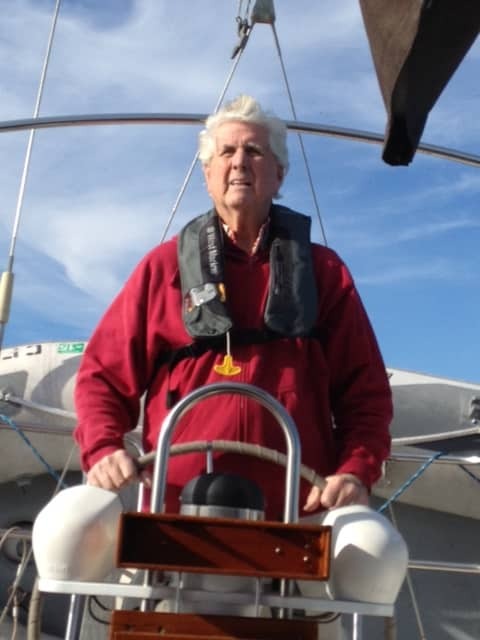 He and his wife, Patti, moved to Trabuco Canyon in 2000 because it offered an equestrian, rural lifestyle within Orange County – and had open space. They quickly became involved with ETI Corral 357 as Activity Coordinators. Next, to have a bit more voice in the club’s direction, Rich was elected as Member-at-Large in 2004. Rich became president in 2006 and served in this role through 2010. One of Rich’s highlights as President was overseeing a large charity event for horse rescue operations serving children with special needs in Orange County. Today, Rich is the Emergency Response Team Coordinator for ETI Corral 357 – He currently supports the Emergency Evacuation Plan for Trabuco Canyon, and works closely with county officials, the community itself and the equestrian community at large. Highlights of his role include completing a community census and establishing communication ties with county agencies and private facilities for coordinated evacuations if necessary. Rich is also chair of the Sierra Club’s Saddleback Canyons Task Force; again, focused on using the resources of the Sierra Club to preserve open space and wilderness access for hiking, biking and riding enthusiasts. 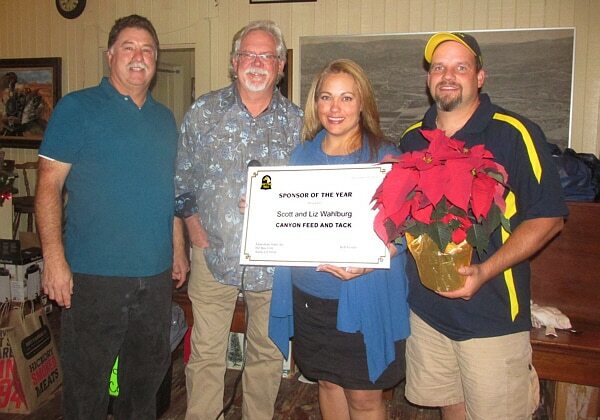 Bob Foster, ETI President, and Rick Balthaser, ETI Corral 357 President, presenting Scott & Liz Wahlberg with the ETI 2014 Sponsor of the Year at the holiday party. ETI Corral 357’s nominee for the Sponsor of the Year Award is Canyon Feed and Tack in Trabuco Canyon, owned by Scott and Liz Wahlberg. I believe that their extreme generosity and kindness, as well as their interesting story make them worthy of this award. Approximately a year and a half ago, Scott and Liz were living in Minnesota and did not really know anybody that lived in Southern California. They decided to purchase Canyon Feed and Tack in Trabuco Canyon, a somewhat bold and potentially risky business move with the equine business being down in general (in fact some local feed and tack businesses in the area had gone out of business) and the economy on shaky ground at best. Upon opening their new business they became fast and immediate friends and allies with ETI Corral 357 – Saddleback Canyon Riders. And, although they just recently celebrated their one year anniversary of being in business, they have impressed us greatly and accomplished much. Speaking at and regularly attending many of our members meetings. Promoting ETI 357 on their Facebook page. Giving all of our club members a 5% discount and working with our club to create a bulk hay discount for both our club and the local community. Supporting local horse rescue organizations by contributing to their organizations and offering discounted prices. Making donations to and offering discounts to O’Neill Regional Park, our local riding area. Making donations to and supporting Camp Pendleton’s Marine Base special events. In short, this very sweet, down to earth and generous couple through ‘Canyon Feed and Tack’ have very quickly cemented a solid friendship with not only ETI Corral 357 – Saddleback Canyon Riders – but the local community as well. I do believe them to be very worthy of the Sponsor of the Year award.